One of the neat things about sharing code with the community is hearing how people have learned from it or are using it in their own work. Of course, the more people use something, the more likely they are to identify problems with it - which is great because it provides an opportunity to improve things! This blog post is about addressing two issues that came up around some code I published recently. The workaround I came up with for StringSource (and that was kindly verified by Roger) should work just as well for the official Source property: I created an application-level event handler for the Loaded event on the WebBrowser and use that event to re-apply the correct content during the "back" navigation. 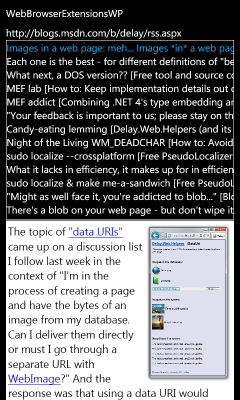 I updated the Windows Phone sample application and added a new button/page to demonstrate the fix in action. If this scenario is possible with your application, please consider applying a similar workaround! Aside: Although it should be possible to apply the workaround to the WebBrowserExtensions code itself, I decided that wasn't ideal because of the event handler: the entire StringSource attached dependency property implementation is static, and tracking per-instance data from static code can be tricky. In this case, it would be necessary to ensure the Loaded event handler was added only once, that it was removed when necessary, and that it didn't introduce any memory leaks. Because such logic is often much easier at the application level and because the same basic workaround is necessary for the official WebBrowser.Source property and because it applies only to Windows Phone, it seemed best to leave the core WebBrowserExtensions implementation as-is. There are two parts to my fix for this problem. The first part is to skip calling the CalculateBestFit override for infinite bounds (it's unlikely to know what to do anyway) and to Measure all the children at the provided size instead. This ensures all children get a chance to measure during the measure pass - which some controls require in order to render correctly. The second part of the fix is to return a Size with the longest width and height of any child measured when infinite bounds are passed in. Because children are subject to the same rule about not returning an infinite value from Measure, this approach means BestFitPanel won't either and that the Panel will occupy an amount of space that's related to the size of its content (instead of being arbitrary like 0x0, 100x100, etc.). The combined effect of these changes is to fix the reported exception, provide a better design-time experience, and offer an more versatile run-time experience as well! The more a piece of code gets looked at and used, the more likely it is that potential problems are uncovered. It can be difficult to catch everything on your own, so it's fantastic to have a community of people looking at stuff and providing feedback when something doesn't work. Thanks again to Robert and Eitan for bringing these issues to my attention and for taking the time to try out early versions of each fix! If you have a URI, you can set the Source (dependency) property in code or XAML or you can call the Navigate(Uri) method from code. On the other hand, if you have a string, your only option is to call the NavigateToString(string) method from code. I'm not sure why all three platforms have the same limitation, but I suspect there was a good reason at some point in time and maybe nobody has revisited the decision since then. Be that as it may, the brief research I did before writing this post suggests that a good number of people have been inconvenienced by the issue. Therefore, I've written a simple attached dependency property to add support for providing HTML strings in XAML via data binding! As you can see above, this functionality is made possible by the StringSource property which is exposed by the WebBrowserExtensions class. It's a fairly simple attached property that just passes its new value on to the WebBrowser's NavigateToString method to do the real work. 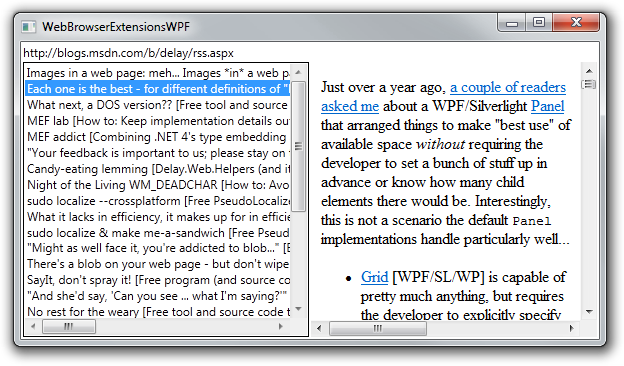 For everyone's convenience, I've tried to make sure my StringSource implementation works on Silverlight 4, Windows Phone 7, and WPF. Aside: The StringSource property is read/write from code and XAML, but does not attempt to detect WebBrowser navigation by other means (and somehow "transform" the results into a corresponding HTML string). Therefore, if you're interleaving multiple navigation methods in the same application, reading from StringSource may not be correct - but writing to it should always work! Aside: Things are more complicated on Windows Phone because the WebBrowser implementation there throws exceptions if it gets touched outside the visual tree. Therefore, if WINDOWS_PHONE is defined (and by default it is for phone projects), this code catches the possible InvalidOperationException and deals with it by creating a handler for the WebBrowser's Loaded event that attempts to re-set the string once the control is known to be in the visual tree. If the second attempt fails, the exception is allowed to bubble out of the method. This seems to work nicely for the typical "string in XAML" scenario, though it's possible more complex scenarios will require a more involved workaround. My thanks go out to Roger Guess for trying an early version of the code and reminding me of this gotcha! 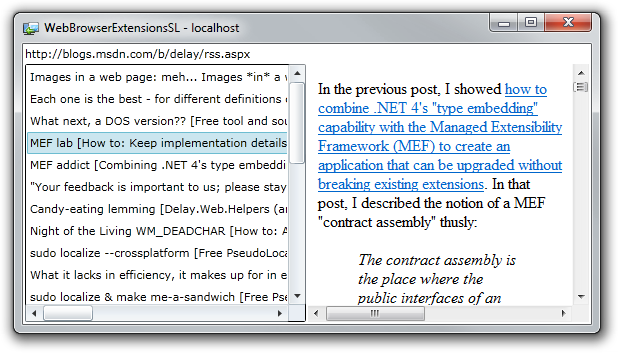 To prove to ourselves that StringSource behaves as we intend, let's create the world's simplest RSS reader! All it will do is download a single RSS feed, parse it for the titles and content of each post, and display those titles in a ListBox. There'll be a WebBrowser control using StringSource to bind to the ListBox's SelectedItem property (all XAML; no code! ), so that when a title is clicked, its content will automatically be displayed by the WebBrowser! The StringSource attached dependency property is simple code for a simple purpose. It doesn't have a lot of bells and whistles, but it gets the job done nicely and fills a small gap in the platform. You won't always deal with HTML content directly, but when you do, StringSource makes it easy to combine the WebBrowser control with XAML and data binding! The topic of "data URIs" came up on a discussion list I follow last week in the context of "I'm in the process of creating a page and have the bytes of an image from my database. Can I deliver them directly or must I go through a separate URL with WebImage?" And the response was that using a data URI would allow that page to deliver the image content inline. But while data URIs are fairly simple, there didn't seem to be a convenient way to use them from an ASP.NET MVC/Razor web page. 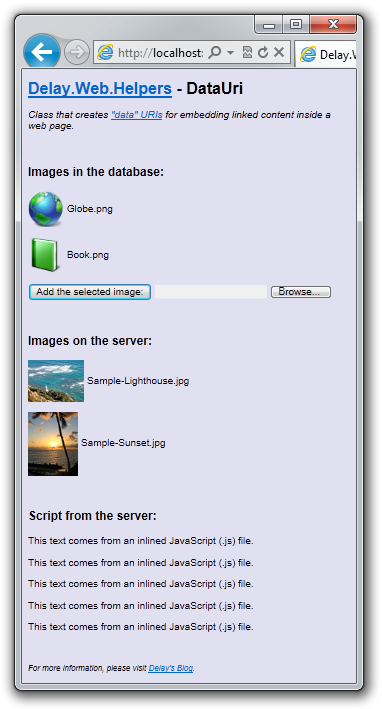 Aside: For those who aren't familiar, the WebImage class provides a variety of handy methods for dealing with images on the server - including a Write method for sending them to the user's browser. However, the Write method needs to be called from a dedicated page that serves up just the relevant image, so it isn't a solution for the original scenario. It takes two pieces of information to create a data URI: the data and its media type (ex: "image/png"). 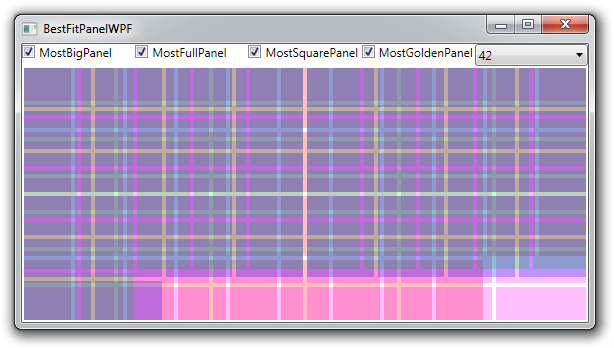 (Although the media type appears optional above, it defaults to "text/plain" when absent - which is unsuitable for most common data URI scenarios.) Pretty much the only interesting thing you can do with data URIs on the server is write them, so the DataUri web helper exposes a single Write method with five flavors. The media type is always passed as a string (feel free to use the MediaTypeNames class to help here), but the data can be provided as a file name string, byte, IEnumerable<byte>, or Stream. That's four methods; the fifth one takes just the file name string and infers the media type from the file's extension (ex: ".png" -> "image/png"). Aside: Technically, it would be possible for the other methods to infer media type as well by examining the bytes of data. However, doing so would require quite a bit more work and would always be subject to error. On the other hand, inferring media type from the file's extension is computationally trivial and much more likely to be correct in practice. Data URIs are pretty neat things - though it's important to be aware they have their drawbacks as well. Fortunately, the Wikipedia article does a good job discussing the pros and cons, so I highly recommend looking it over before converting all your content. :) Creating a data URI manually isn't rocket science, but it is the kind of thing ASP.NET web helpers are perfectly suited for. If you're a base-64 nut, maybe you'll continue doing this by hand - but for everyone else, I hope the new DataUri class in the Delay.Web.Helpers assembly proves useful!